Beach curls or sassy straight? Look fabulous this summer with Supercuts incredible savings! Get 3 for 2 on ALL Paul Mitchell products instore now! 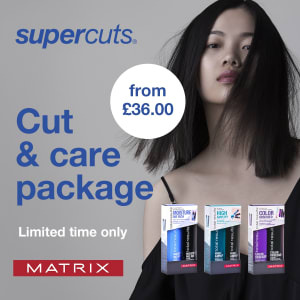 Cut & Care offer Re-fresh your look ready for summer with Supercuts cut & blow dry PLUS take home full sized Matrix shampoo & conditioner from £36. For full details please ask in store. Terms and conditions: Not valid with any other offer or discount. Available for a limited time only. Whilst stock lasts. Cheapest item free. No double discounts, selected packs only, whilst stocks last.